•	Cholera does not kill directly; you die from the dehydration that intense diarrhea inflicts. •	People with cholera-induced diarrhea pass many gallons of water a day. •	You get cholera from eating tiny amounts of poop from someone who has it. It is not airborne. That’s why clean water and effective sanitation, and hygiene keep it from spreading in “developed” countries. Cholera can survive in standing water and can be transmitted in bilge water of ships and other water sources. It is essential to filter or otherwise decontaminate water before using it. •	Cholera spreads more during the rainy season. As water sweeps through villages and other settlements, it takes the pathogen to rivers, lakes and streams where it can survive and spread. Most people get cholera from contaminated water, not directly from other people. •	80% of the people with cholera have no symptoms! Imagine how hard it is to stop when people are traveling all over Haiti without symptoms. Even if you quarantine those with symptoms, there are a lot more people spreading it that feel perfectly healthy – like the one that traveled to Florida last week. •	Cholera does its deed very fast. There are many reports of people getting symptoms in late afternoon and dying before morning. Most deaths are within two days of the onset of symptoms. •	If you can quickly get water back into the blood, most of the people with cholera-induced diarrhea will live. A percentage will survive even without treatment – this is especially true if you are healthy and eat a good diet. •	Human waste must be kept from entering any water supply. That would include wells, other groundwater, streams, lakes, ponds and rivers. It can continue to live in most water once it gets into the supply. The diarrhea caused by cholera is very runny and if not contained, can easily end up in a water supply somewhere. Fish and shellfish can carry cholera and must be thoroughly cooked. •	If there are no sanitary latrines in the area, dig emergency latrines immediately at least 30 meters from any water supply and ensure it is not in marshy ground nor does it penetrate the water table. Ensure all people use the latrine. Cover human waste with dried grass, soil or other brown organic material after each use. While you are building a latrine, make sure that all human waste is buried so that flies cannot access it and it cannot run into water supplies when it rains. •	Flies can spread cholera. It is important to keep food covered to prevent them from transmitting cholera. Flies are attracted to garbage and human waste, so keep garbage far away from food, and cover it if all possible. Ideally, toilets will be sealed so that flies cannot enter into them. The seating area can be sealed so that when the lid closes, flies cannot get into the toilet area. It is well worth taking the time to do this to keep the fly population down as they spread many types of diseases in the tropics. o	If you don’t have soap, you can make some from the moringa plant: http://kalanke.web.officelive.com/MoringaSoap.aspx. o	Yucca root can also be used as soap – just put some of the root directly in the water bottle that you are cleaning your hands with, shake it up, and remove root. The saponins in the root are what create the soap quality. o	Soap nuts can also be used as soap – boil a few nuts in water, pour in a jar and then seal the jar tightly – it will spoil after a bit. o	The fruit, leaves and bark of Acacia concinna can be dried and made into a soap paste – used in India for centuries as soap and shampoo. •	Contaminated clothing, bedding, etc (that human waste has gotten on), must be buried or boiled. Solarizing it (heating it up in the sun) can also kill cholera. •	Cooking food will kill cholera. Shellfish should be cooked at 160 degrees F or higher for at least 10 minutes. If the bacteria is not killed in the food, it will multiply rapidly as the food cools. •	Filter and disinfect all water before using it to drink or wash vegetables or dishes. This is vital to prevent spread of disease as it is very difficult to keep the germ out of the water supply especially in the rainy season. Any water that could end up in the mouth should be treated, including water used to wash vegetables. o	Place water in clear plastic bottles and ideally set them on dark surface that collects heat, or shiny metal, and leave it in full sun for at least six hours. This kills water borne pathogens. The bottles should no bigger than 1.5 liters. This is the fastest and one of the most complete ways to kill all pathogens. If you do not have full sun, the bottle should be left out as long as two days. 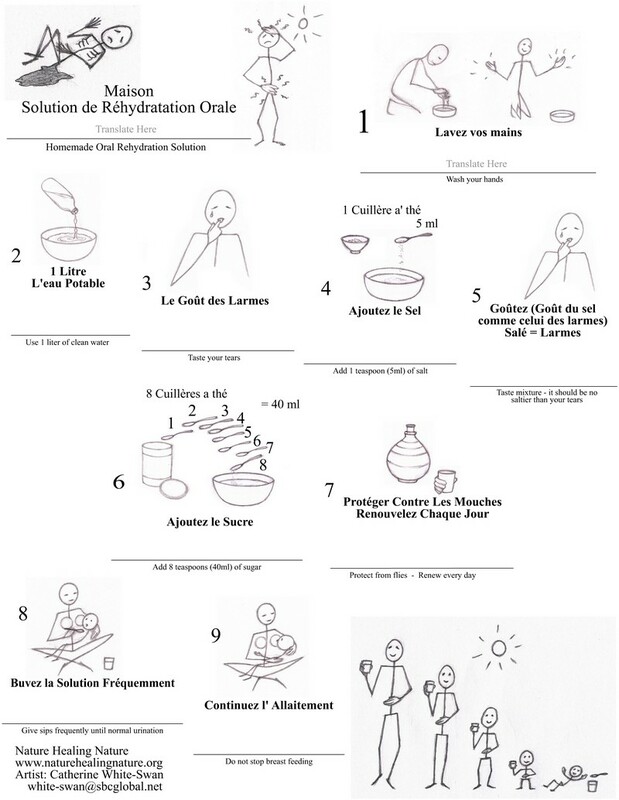 This method is called the SODIS (solar disinfection) method. o	If the water is cloudy, filter water through sand or cloth that has been folded several times. This is important as cholera and other disease germs can hide in sand particles or other particles and survive SODIS. Filtering with cloth or sand alone will not kill all the cholera – you must use SODIS or boil the water too. o	Boil water to a hard boil (many bubbles coming fast to the surface). o	Solarizing water is another option. You can build a fairly large solarizer that will handle lots of water. •	If your water supply is filtered and human waste is composted and protected from flies, you will interrupt the disease vectors and will have no more cholera. Correct handling of human waste (keeping it isolated from water and flies and composting it), and filtering water is the only way to eliminate the disease from an area. Washing hands before preparing food is essential as well. If you do these three things, cholera cannot gain a foothold in your area. You will also eliminate dysentery, typhoid and other diseases. •	Dehydration kills. Rehydration will save lives. Drinking water is not enough – too much salt and potassium is lost in the diarrhea to absorb the water. •	Immediately upon getting symptoms, add one teaspoons of salt and 8 teaspoons of sugar to one liter of treated water and drink it. It is important you start rehydrating as early as possible. •	Continue to drink this preparation throughout the course of the disease. Coconut juice has very complete electrolytes in it and if available should be consumed liberally by anyone with cholera symptoms during the course of the disease. •	If you have access to it, drink water mixed with oral rehydration packets. When the earthquake hit Haiti last January, I was teaching a permaculture course in Little Haiti, Miami, and there seemed to be no choice but to get involved. After assessing what was most needed, I assisted six permaculturists and sustainability experts to get to Port Au Prince shortly after the earthquake and this is their story. After receiving reports on the ground, we determined that the major life threatening situations were water and sanitation. There were no city wide water or sewage systems in place before the earthquake, and water borne disease had always been a situation but in the chaos after the quake, the risk became dire. We knew that resources would be almost non-existent in some areas and rescue organizations might not reach those areas for weeks. Permaculture had solutions, using local resources, that others didn’t have for handling human waste and unfiltered water. Port Au Prince airport, the only international airport near the quake zone was closed to everything but military and rescue planes, and other ways into the quake zone, such as the road from Dominican Republic, were unpredictable – many roads had sustained damage in the quake. I arranged for the teams to fly into Port Au Prince via planes chartered by Church of Scientology Volunteer Ministers disaster relief organization to bring emergency medical teams there from the US. They would stay at the Volunteer Minister camp and have a relatively safe, established base camp to operate from (though conditions were very primitive and harsh, at first). They would also have ready access to other disaster organizations, military personnel, and government officials, which would allow them to be more effective. This worked out well with the teams rapidly creating connection with major hospitals, UNICEF, US Army, ACTED and other major organizations – all of them needed their specialized skills. The goal was to save lives by getting low tech, sustainable solutions out there rapidly, while establishing relationships with both Haitians and NGOs that could be developed in the future for longer term design projects. The first team that arrived was Mark Illian and Monika Cikhart, from Nature Healing Nature (naturehealingnature.org), a non profit organization that specializes in teaching villages around the world how to filter water via low tech methods, using locally available materials such as sand and plastic bottles. The second wave was made up of Rodrigo Silva, a permaculturist and sanitation specialist from Portugal who has built compost toilets for 30,000 people at a time at European festivals; Nicole-Klaesener Metzner, another compost toilet specialist from Austria, and Andrew Larsen, a systems engineer and sustainable sanitation expert from Salt Lake City. They were flown into Haiti within a few days of responding and were in high demand immediately. Hunter Heaivilin, a permaculturist and tropical plant expert, arrived a few weeks after the quake and stayed for several weeks. The “water team” of Nature Healing Nature immediately set to work educating people on how to filter their own water. They worked with the sanitation team, but also on their own when it made sense to do so, traveling where the need was greatest, such as to Leogane which was getting little assistance or relief. Because water filtration has traditionally been poor in Haiti, their educational work had quite a lot of potential to save lives – the death rate from dysentery and other water borne diseases, especially of children, was high even before the earthquake. In addition to helping provide a clean water supply, they set up showers for rescue workers, such as medical personnel who hadn’t been able to shower for days, they helped Haitians link up to organizations that had funding and resources, they helped organize emergency food and water distribution, and did whatever was necessary to facilitate the process of Haitians getting back on their feet as sustainably as possible. Many people who survived the quake but were injured were losing limbs or dying because of the horrible sanitation in the makeshift hospitals. All the hospitals in the area were damaged and operations were occurring in makeshift tents with improvised instruments. There were not enough doctors so rescue workers with no medical background or experience were instantly deputized to act as surgeon assistants. There was so much chaos that it is hard to comprehend. Piles of garbage were heaped near the operating theatres and recovery areas, and it was difficult to keep the areas clean or sterile because of lack of medical supplies or any other supplies. The sanitation team’s first major project was the main general hospital in Port Au Prince, where sanitation was almost completely out of control. Huge piles of garbage surrounded the hospital with everything from human feces to body parts to needles to toxic substances in the mass. The toilets were backed up, filthy, and unusable. Our team worked out how to clean the area and arranged for trucks to haul the trash (it was a major feat at that time to get fuel, never mind a truck to put it in); they set up proper disposal systems, and got funding to pay local Haitians to clean the trash sites so that tents could be set up to treat patients in a clean environment. They were not able to set up compost toilets there, as the hospital was under great pressure and staff didn’t want to risk anything but known elements like portapotties, but they were able to educate a number of disaster and rescue personnel on the advantages of composting human waste. As a result of their work, an inspection of the site found almost no garbage anywhere in the vicinity of the hospital. This most certainly contributed to saving lives and limbs. Their next target was sanitation for a nearby camp. A huge handicap was lack of materials – there was almost no wood or organic material available anywhere. Andrew had brought in material to create a compost toilet system, but they ended up using different models because there simply wasn’t enough building material available. They improvised, using shipping pallets and whatever material they could find. Their initial target was to isolate human waste so it wouldn’t contaminate water. In the process, they taught Haitians how to build compost toilets and explored how organic material could be created by growing fast growing plants like vetiver grass and bamboo (both of which grow readily in Haiti). In between, because of the extreme need, they helped distribute food and water, and did anything else that was needed. They inspected wells with the US Army, they taught rescue workers how to build safe latrines for their camps, they built showers, they worked with UNICEF to assess sanitation needs for orphanages. Feedback from rescue workers were that their skill sets were perceived as very, very valuable, they were quite grateful they had come, and they would welcome permaculturists and low tech, sustainable solutions at any disaster site. The first few weeks were filled with chaos and triage situations. It took courage and dedication to deal with the conditions they operated under – these guys are tough! But even under the most extreme conditions, many seeds were planted and beneficial connections were made. And lives were saved! Most of the long term design work to create sustainable systems started many weeks after the disaster, however. As systems become more established in Port Au Prince, Rodrigo started organizing and attending meetings to create recycling in Port Au Prince. The waste streams are impressive – millions of plastic water bottles shipped in during rescue efforts, cardboard, tent material, etc. He experimented with paper brickets, which replace charcoal in the ubiquitous open cook stoves that are destroying forests in Haiti. Nicole started working for an NGO and got them to use arbor loos in one of the camps. Andrew connected with the Give Love project (givelove.org) in Cite Soleil, and helped build a compost toilet system for a camp of 2500 people , with a team made up of Joe Jenkins, Rodrigo, and other humanure experts. PDC student from Little Haiti in Miami, Paule Jacques, hooked the project up with her contact, Minister of the Environment of SE Haiti, Jean Ked Neptune, who connected Mark and Monika, Hunter and Rodrigo with Haitian non-profits, so they could “teach the teachers” sustainable methods of growing food and handling water and waste with workshops. Rodrigo, who is still in Haiti, has continued to build compost toilets, teach people about composting and set up recycling systems for various organizations. I traveled to Haiti in May 2010 to assess the projects and the situation in Port Au Prince at that point, and to connect with Jean Ked. I felt that training Haitians in permaculture was key, and was able to fund a trip to Pine Ridge for the Minister of the Environment and his associate to do the Permaculture Design Course there. We felt Pine Ridge was a very appropriate venue because of similar conditions of watersheds, economics, and degraded landscapes. Ked has started a vermicomposting project that will link into creating a stable local economy as well as revitalizing degraded lands, and intends to do village sized permaculture projects. We continue to work with him and others in the area to help facilitate their projects. Because of the connections we made through this project, we’ve been able to link up several permaculture resources across the country with each other so they can exchange energies, and we’re currently assisting in the organization of a database of all things permaculture in Haiti, so that more beneficial connection can be achieved. All in all, the project was a success, with a number of things coming from it that will continue to propagate and fruit. It is likely, for instance, that the low tech methods of purifying water, and education on how to prevent water contamination from human waste may be saving lives as the cholera epidemic unfolds. We continue our efforts to educate people on these techniques. Though the chaos of the immediate aftermath of a disaster of this magnitude is not conducive to design and planning work, the rescue team is glad that they could be there to help when it was so desperately needed. Many seeds have been planted that will continue to fruit into more sustainable systems.